How do you relieve bunion pain without surgery? Having a bunion surgery can definitely cost you a lot, it could be more than how much you earn in a month or two. Not to mention that you would also have to wait some time for your foot to recover which might cost you more money, as you won’t be able to go to work during that time. Given this, we can say that a bunion treatment without surgery is one of the finest choices that you should consider. It can help you relieve the bunion pain and allow you to continue doing your normal daily activities without worry. Bunion (Hallux valgus) is one of the most common foot ailments. Having a bunion pain is far too annoying not only because it prevents you from wearing the shoes you love, but also because you may feel pain every time you move or walk, thus your life become greatly affected especially if you are an active person. But first, you should be able to know what the bunion symptoms and signs are so that you can set your mind straight to relieve your bunion pain. One of the signs that you are having a bunion in your toe is the bulging bump that you can find in it. It is more likely to appear at the side of your big toe. The location of your bunion bump may just be the reason why your big toe seems to be leaning to your other smaller ones, this can get really painful. Swelling and redness may also be the symptom of having a bunion condition in your feet. It would seem to hurt whenever you move from one place to another, that swelling feeling inside your toes would make it harder for you to move, it can totally affect your balance and prevent you from enjoying your normal daily activities. Calluses is another sign which could make you certain enough about having a bunion in your toe. It is often found at the first and second toe area where these two toes would seem to overlap. It is true that this could look too gross but you have to endure it and give it the treatment that it needs. Being grossed out about it cannot help you to relieve bunion pain. How to Relieve Bunion Pain? Using bunion toe separators or gel pads can definitely help you relieve your bunion pain. These pads are capable of protecting the affected area of your toes as well as that of the base part of your foot. Bunion Pads can be used to prevent any more of the impending growth and infection of your bunion. This means that there will be an enhanced movement as well as comfort when you have these bunion pads on. You can wear them anytime and anywhere you go. Some of the best bunion toe separators are the ones that fit inside your shoes, you can wear those when you go outside, at school, work or even while doing your normal daily activities. Can you imagine having your bunion treated while you are on the go with your friends and your colleagues at work? Yes, that is truly possible with these bunion separators to relieve bunion pain. This is one of the best bunion toe separators that you can ever have to relieve bunion pain. 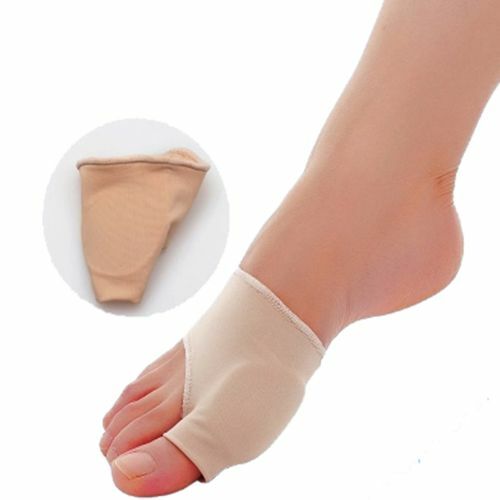 When you use this, you can rest assured that it can relieve your pain, promote proper blood flow in your circulatory system, and give you the strength that once thought would be gone forever just because you have a bunion.By wearing this silicone Hallux Valgus Brace you can heal and relieve your bunion pain while recovering the foot strength and balance. 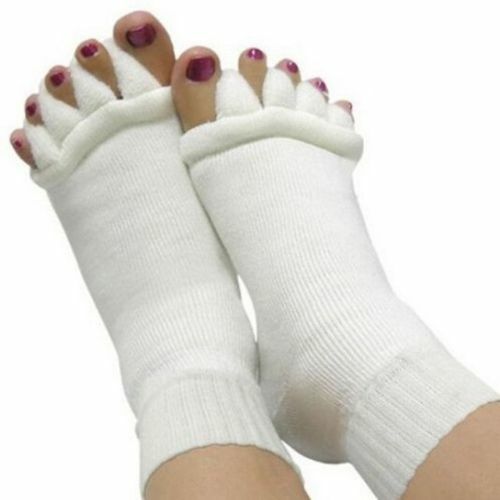 These toe separator socks feel very comfortable on the foot, just like any kind of socks you can wear them at night while sleeping to relieve your bunion pain. They are made of 100% cotton and are easy to wash. These socks are great for Hallux Valgus, Bunion as well as toes separation and alignment. The Hallux valgus bunion toe separator socks help correct and align toes in such a way that makes your toe bones adapt to the change. Therefore, it is capable of fulfilling your dream to relieve bunion pain. 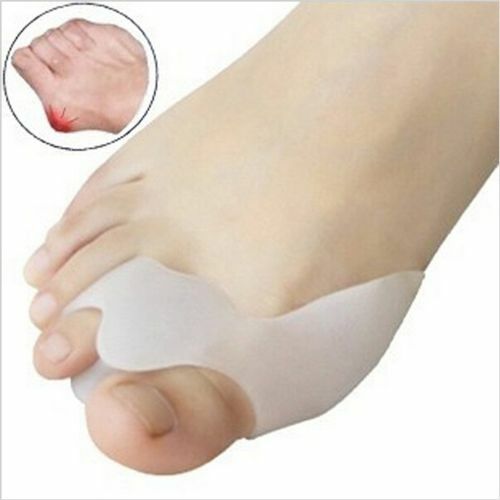 Stretchable Nylon Foot Guard is also effective in giving you the desire to relieve bunion pain. It is capable of realigning your toes such that it would look like that of normal toes. Stretchable Nylon Foot Guard forces your bunion affected toes to adapt the new and correct alignment in such a gentle manner. It also straightens your big toe such that it wouldn’t seem to lean to your other toes. This foot guard is so comfortable and can fit easily in your shoes. The Big Toe Separate Orthopedic Brace is an effective bunion toe separator that can relieve your bunion pain. It is made of high-quality silicone to ensure maximum comfort and support. It feels comfortable in a way that doesn’t bulk when you wear it and you can definitely fit this in whatever shoe that you would want to wear. This is another one of the best bunion toe separators that you can find in the market. This can certainly and with no doubt help you relieve bunion pain without even resorting to surgery. Silicone Cloven Device aligns your toes in such manner that it would look like its normal appearance.It has two holes to fit any of the toes of your foot; Big toe, small toe or middle toe and its succeeding toe. The silicone material provides maximum support, comfort and flexibility. This is another bunion toe separator that can definitely support your need to relieve bunion pain. This toe separator and straightener has the capability to properly align your big and small toes at the same time. It helps you relieve bunion pain in your feet. It is made of high-quality silicone to provide maximum comfort and support. It can fit any foot size, it is also very slim and can fit inside your shoes or under your socks with no problem. It is very simple and convenient toe separator to wear anytime, anywhere. The silicone big toe orthopedic brace provides maximum big toe protection and support, while separating the toes to relieve bunion pain. Bunion can often cause your toes to lean to the other toes’ direction giving you a painful sensation.This brace straighten and align your toes, besides providing protection and comfort. It is made of medical silicone material. It is also very lightweight and convenient to use. You just have to put it on your toes and leave it for the rest of the day. It doesn’t hinder you from wearing your favorite pair of shoes when you want to go out, and It won’t be a burden on your feet. Infact, it can fit inside any kind of shoes. As a result, it doesn’t create much bulge which is a total turn off. The silicone big toe orthopedic brace is also designed to be breathable such that you wouldn’t have to worry about the smell of your feet when you wear this. There is another way to relieve bunion pains and that is by exercising your toes. This activity can definitely help you make your abductor halluces stronger. Abductor halluces is actually a muscle in your foot which is in charge for your big toe’s flexibility. Therefore, if you perform this exercise, there is a huge chance that you will start to experience bunion pain relief and a reduction in the discomfort you feel. First, you need to have an elastic band that you can place around the big toes of each of your foot. You have to make sure that your elastic band is quite thick so that it wouldn’t snap in just a little effort of stretching it. Next is that when you are already able to stretch it out by turning your feet in the outward direction, you should retain this position around one minute to make sure that there is a lasting effect to your big toe. After a minute, you should let the band go and relax for another one minute, then repeat the whole process again. You should execute this exercise for 15 minutes (2 to 3 times) every day, depending on your schedule and your determination to relieve bunion pain. However, you have to be aware that doing this exercise would not help you with the repositioning of your toes. It is meant to help your toes become more flexible such that you would be able to walk and do physical activities with a reduced pain in your feet. This could enhance the blood circulation throughout your body and improve you red blood cell activity. One of the best and simplest ways to relieve bunion pain is cold compress. Aside from the fact that ice cubes and washcloths are accessible, this is considered one of the simplest because you can still administer this treatment on your own. This implies that even when your friends or family are too busy to attend to your needs, you can still do it. This is a choice that most people opt for when they do not feel like visiting a clinic or a hospital for a checkup. First, you should place plenty of ice cubes in a washcloth that is thin enough such that the coldness of the ice cubes could penetrate through it and into the area of your foot which has a bunion. Next is that you have to wrap it up in a proper way such that the ice cubes wouldn’t fall off from their places. Being able to wrap it properly makes a more effective non-surgical treatment than a lousy wrapped one. The third step in this bunion treatment is the application. You can now apply the ice pack on the foot that has a bunion. Leave it at that position for around 10 minutes in order for its effects to manifest. After 10 minutes, you should remove the icepack and wait for 5 more minutes to apply it again. You can actually repeat this process about two to three times to relieve bunion pain. You have to be aware that direct contact of ice can cause you to have ice burns. Thus, you should wrap it up first with a thin washcloth to avoid further injury. A warm oil massage can also be employed to relieve bunion pains. One way to make it as effective as possible is to massage the affected area with some warm oil. You should know that an efficient massage can definitely improve your blood circulation throughout your body. When your blood circulation has been fully improved, then you are more inclined into reducing the discomfort of bunion pain. This also helps to completely avoid developing corns as well as calluses especially when the bunion pain is left untreated. First, you have to warm the castor oil that you manage to have. As a substitute, this can be an olive or coconut oil. You need to heat it in the microwave. And then you need to dab the warm oil on your bunion. Third, using your fingers, do the massage. The oil massage can take up to 10 minutes. Plus, it’s not just an ordinary massage, you have to do in a deep-friction style. You have to do this for about 2 to 3 times a day to relieve bunion pain. You may also ask someone to do the massaging for you. However, since they don’t feel the bunion pain that you are having, the quality of their massage may not be as great or effective as yours. One of the causes of bunion pain is the inflammation. Epsom salt has a high amount of magnesium sulfate which helps in relieving the inflammation and pain that you may experience when you have a bunion. How to use Epsom salt to relieve bunion pain? First, bring any foot tub you have and pour quite a few tablespoons of Epsom salt in it. Your foot tub should be spacious enough to be able to accommodate your foot up to your ankle. Next, fill the tub with lukewarm water and soak your feet in it. Keep your foot submerged in the water for about 15 to 20 minutes. For a more efficient bunion treatment, you should repeat this procedure for about 2 to 3 times a week. If you do not have Epsom salt, using just warm water could also help relieve bunion pain. Chamomile is also one of the most effective treatments to relieve bunion pain. It has an anti-inflammatory factor that could help you in reducing the swelling and the inflammation that can result in a lesser pain. The first step that you will have to do is to brew a cup of chamomile tea. Then apply the used tea bags on your bunion for around 10 minutes. You need to do this 2-3 times per day until you start experiencing bunion pain relief. As an alternative, you can just mix a tablespoon of dried chamomile with water. Make sure you have enough volume of water and chamomile inorder to form a paste. Then, apply that chamomile paste on your bunion area and leave it for 15 minutes. After that, you can rinse it off with water. For a more effective remedy, you can do this 2 – 3 times per day. Just like chamomile, calendula is a herb which is full of anti-inflammatory factors that could help you relieve bunion pains. It is also capable of preventing the risk of having corns and calluses that may result from having a bunion. First, you need to apply the calendula ointment (which is just an over-the-counter ointment) on your bunion. You need to do it 2 to 3 times a day for maximum results. As an alternative, you can just crush fresh calendula leaves, if you have it, and have it extracted. Apply its juice on the affected area and then you can allow it to dry on its own. You need to do this for 2 to 3 times a day in order for it to come into effect and relieve bunion pain that you are suffering from. It is important for you to maintain a healthy weight so that not much pressure would go down to your feet. Being overweight could negatively affect your bunion and make your condition worse. If you are overweight, you should consider losing some weight and you are more of like hitting two birds with one stone. Not only you will improve your overall health by exercising and losing weight, but you will also reduce the weight on your foot (especially on the bunion area) which helps you relieve the bunion pain. You can also use painkillers when you think you just cannot endure the pain anymore. Some example of painkillers that you can use are paracetamol and ibuprofen. You should bear in mind, though, that you just cannot take it whenever and whatever dose you like. You should try to look at the leaflet that comes with your painkiller so that you will know what the right dose is for you to relieve bunion pain. Now, You know how to relieve your bunion pain without surgery. With this, you do not have to visit a doctor or spend too much money. Why would you have a surgery when you have these natural bunion home remedies!. By having these herbal plants, the necessary tips and right braces to relieve bunion pains, you can administer the treatment on your own! If you liked this information, please share and leave a comment to let us know what do you think! Also, let us know which method has helped you to relieve your bunion pain. This entry was posted in foot health care and tagged bunion surgery, Hallux valgus, Relieve Bunion Pain, Toe Separators. 7 Big Toe Joint Pain Causes And Treatment!